On Saturday we went across to Hemyock to the Repair Café run by the Blackdown Hills Transition Group. It’s such a good idea, bringing broken things to be repaired rather than throwing them away. This particular café marks the 6th one the Transition group has held, over the duration of a year. It has gone from strength to strength with more repairers and more people than ever turning up with stuff to be repaired. Whilst waiting for their items to be repaired, people could avail themselves of a bacon buttie or cake with coffee and tea. It becomes very social with people sitting around talking to each other whilst they wait. Repair cafes started in Holland but the idea has spread very quickly. Most of us old enough to remember, will know our parents used to repair items rather than throw them away, but recently manufacturers have been making stuff that is difficult to repair, and they would rather you went and bought a new one and threw the old one away. This is no good for the environment and as an organisation the Transition group is about finding ways to reduce waste and keep things out of landfill. There was bicycle repairs, electrical repairs, computer and furniture repairs, sewing, knife sharpening, watches and clock repairs, and upcycling of items. Additionally there were a variety of tools for sale that had been donated. It was busy, busy, busy and became quite difficult to park! The Repair Café is a huge success now and will continue every other month in Hemyock, but we are trying to get them going in other parts of the Blackdown Hills too. 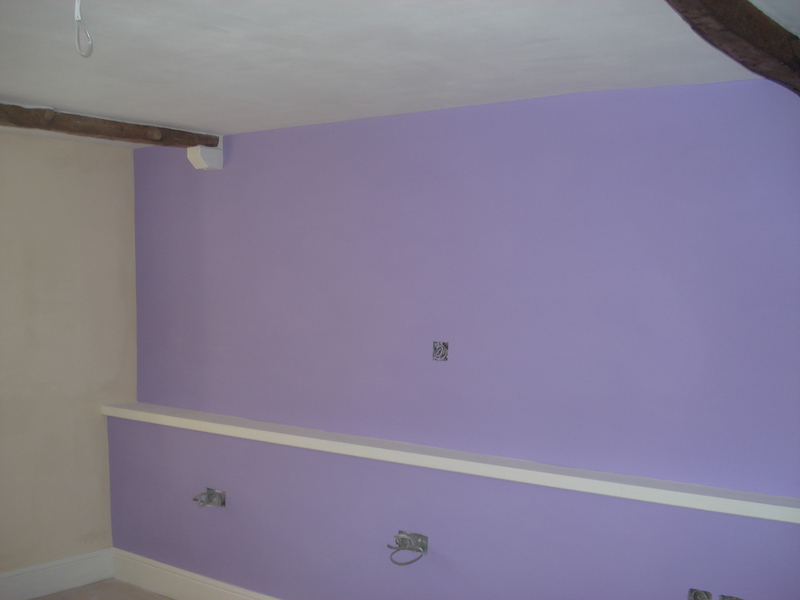 The first floor bedroom has had 2 coats of lilac paint to make a statement wall. We are really pleased with this. The 2nd floor bedroom is going to have a blue wall as a statement wall. Curtains and bedding will all co-ordinate so hopefully the overall theme will be pleasing. The other walls will be magnolia with white on the woodwork. 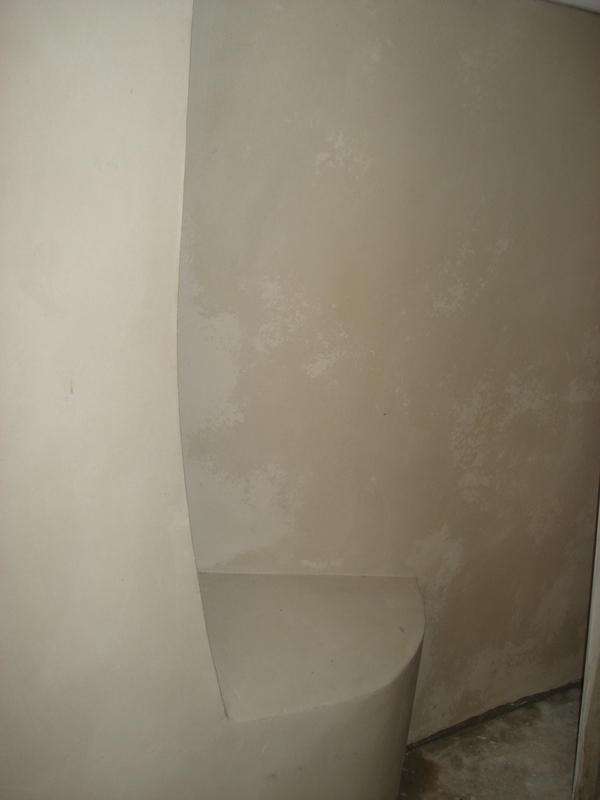 Its lovely to see the wainscoting going down especially round the curved walls, so clever!! 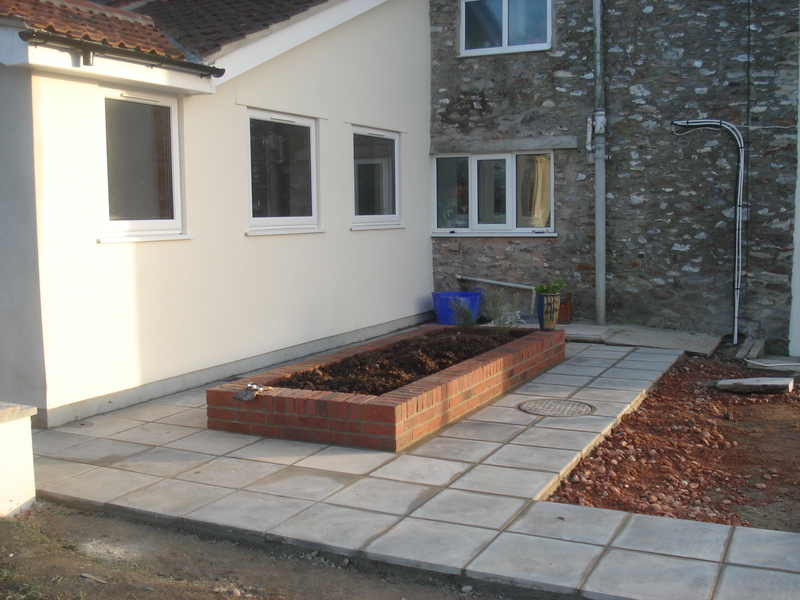 Outside the builders have been laying slabs around the raised beds that they created outside the kitchen. 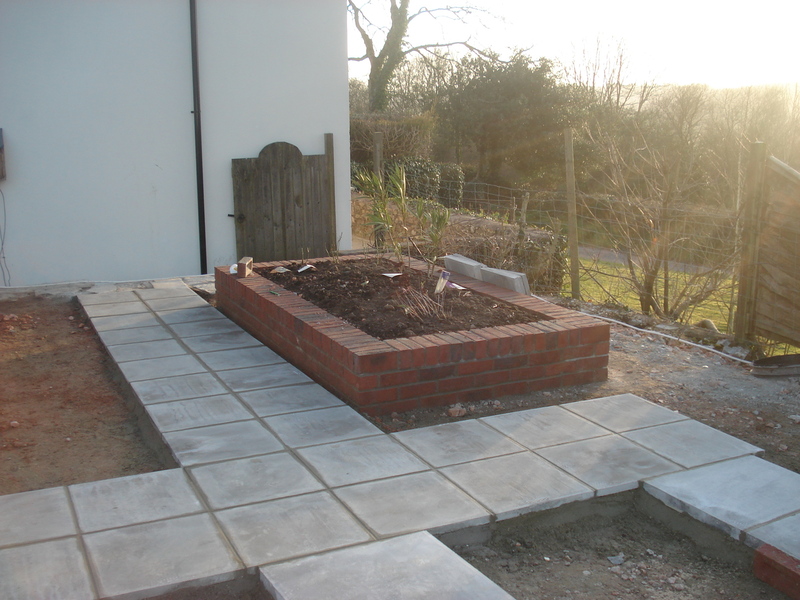 Over the weekend we shall be adding more plants, herbs into this bed (as above) and flowers into the other bed. Next week they are going to start tiling. It’s so exciting seeing it all come to fruition after so long. Can’t wait for it all to be finished. Mid April is the expected finish time. 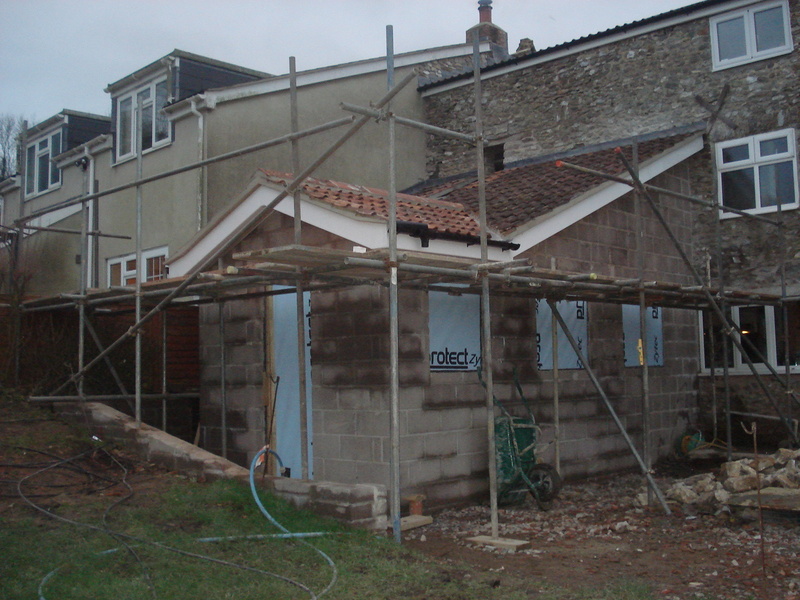 The builders are really making progress on the renovation and extension. The first fix electrics has gone in and we have wires hanging down from the kitchen ceiling where the spotlights will be and patress boxes where the sockets will be. The plumber has been working alongside the electrician and he has put in the central heating pipes, the water supply pipes to the showers, toilets and washbasins and has drilled through to our side of the house to meet up with the existing supply. The result of which is that we have had to empty airing cupboards, clear the bookcases in the store room creating even more chaos in the home, so that the plumber has access. 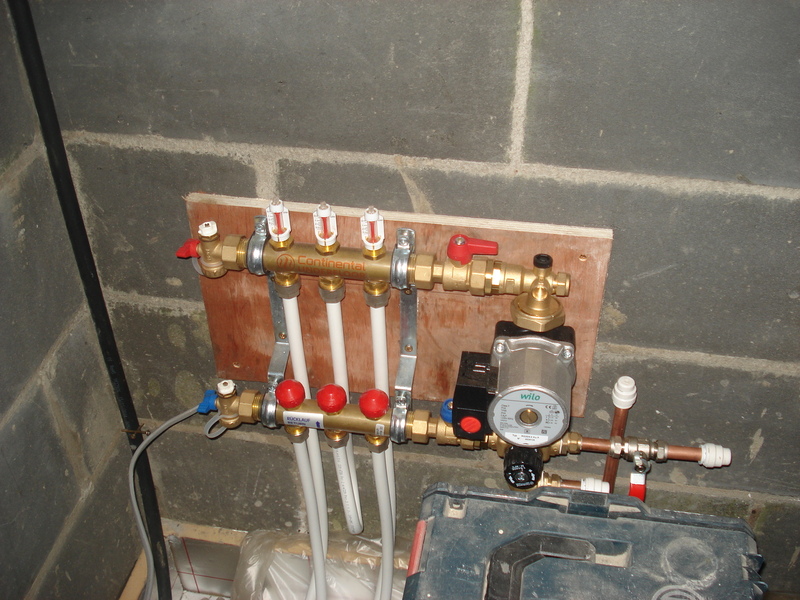 This is the manifold for the under floor heating on the ground floor. 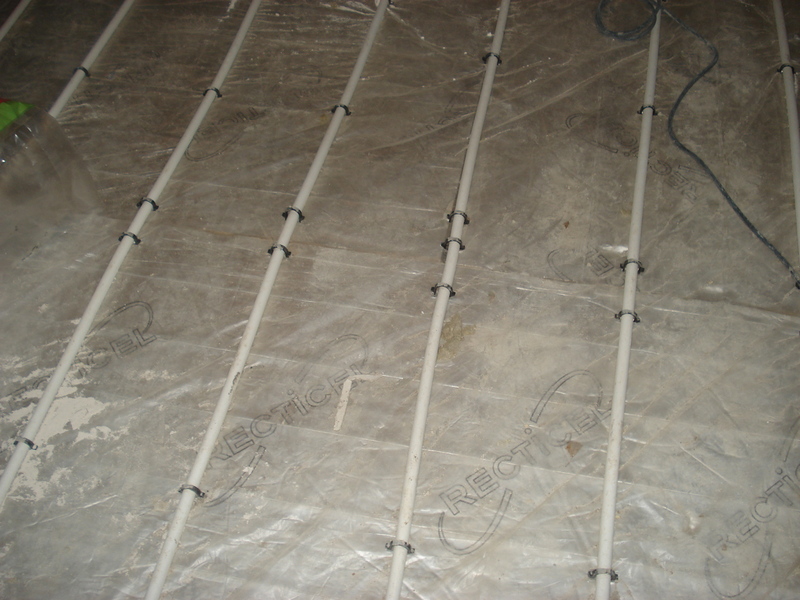 And this is what the underfloor heating pipes look like before the concrete is laid over the top, which is what the builders are doing today. 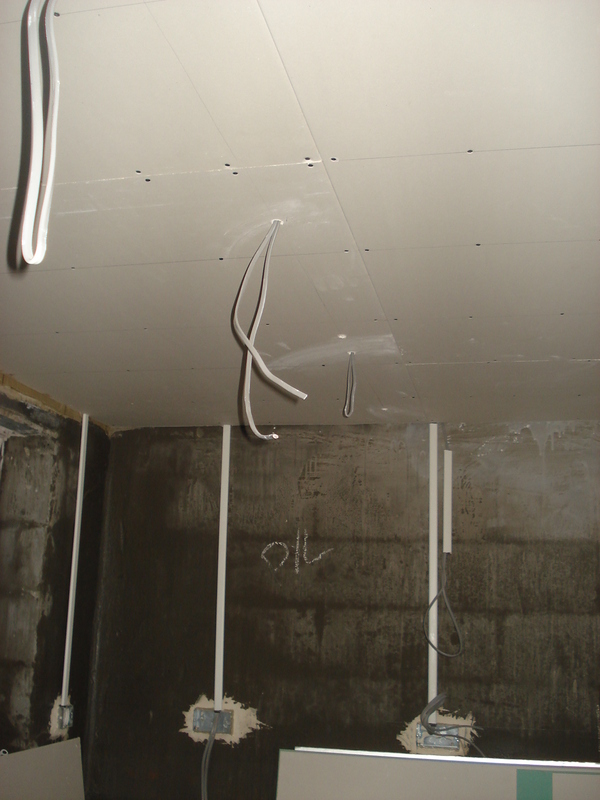 Yesterday they started the plastering on the first and second floor, in the bedrooms. It really transforms the rooms and the finish is silky smooth – wonderful. 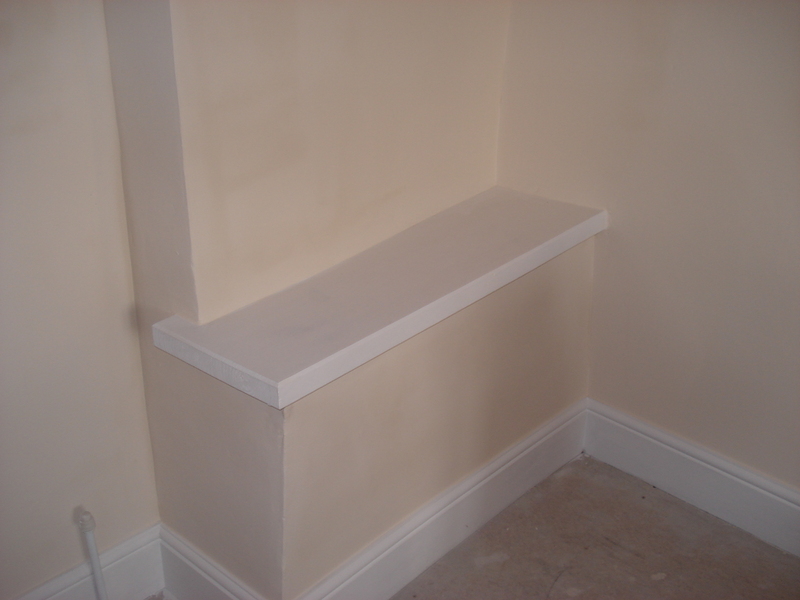 With the plastering on the walls the patress boxes disappear into the walls and will be ready for the second fix which is adding the sockets. This makes the nooks and crannies stand out even more. 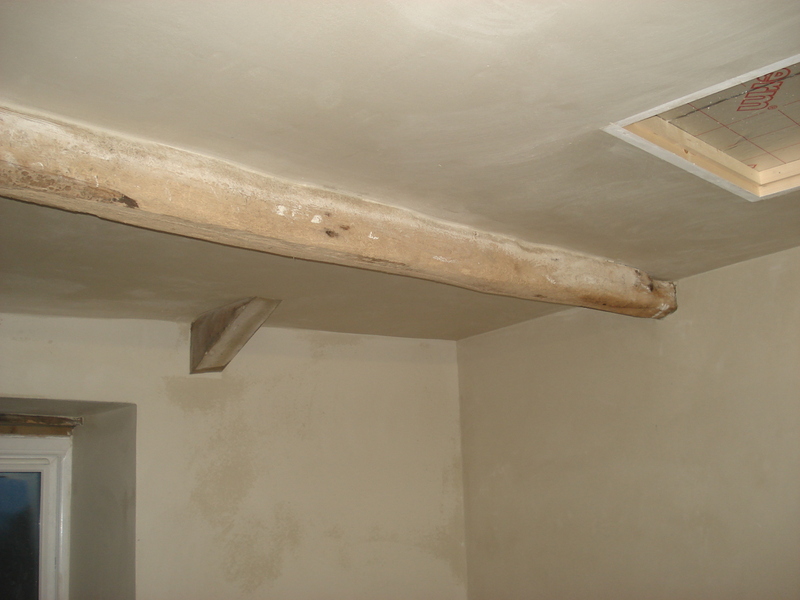 The old beams on the ceilings seamlessly fit in now. Next job for us will be to choose the colours for the walls to be painted. 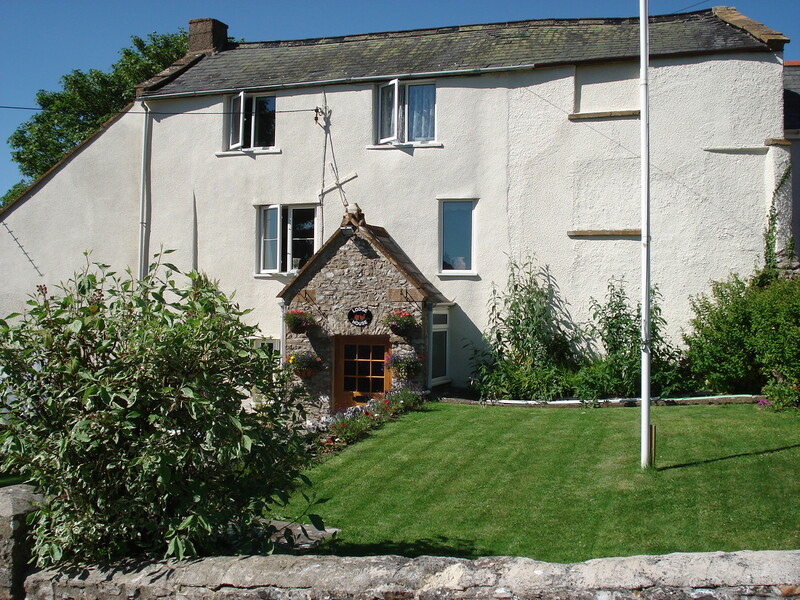 It is a shame we have so much disruption in the main part of the house as we are closed as B&B and having to turn business away. Anyway we have the finish to look forward to. It’s been really exciting seeing the derelict part of the house known as the pump room, transform. Not more so than the front of the house where previously the front windows on the right were blocked up. To see new windows and repositioned too, makes it look like a proper lived in house now. There has been lots of other progress too. The plumber has been in all week doing the first fix of all the pipes to the central heating and the bathrooms. The ceilings are in. 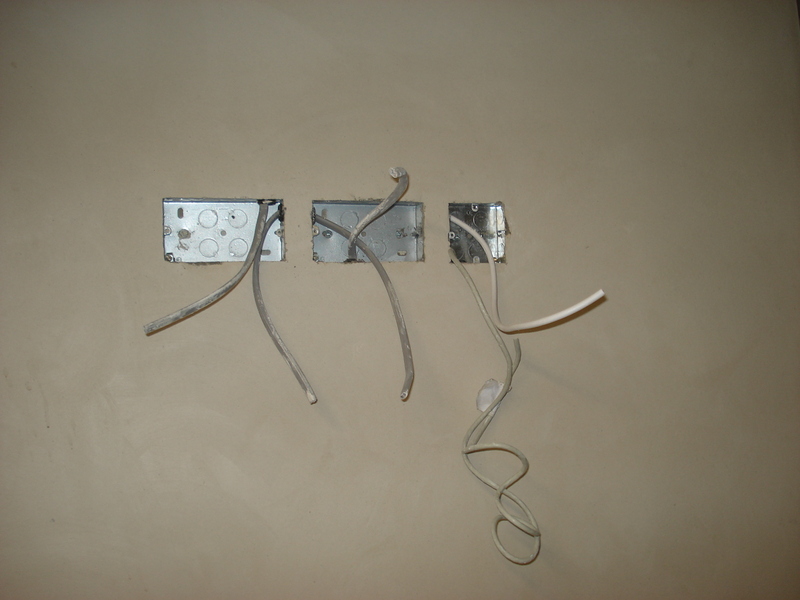 The electrician came by on Friday to see what was needed and he will be starting on Monday. I think we will see fairly rapid progress now. 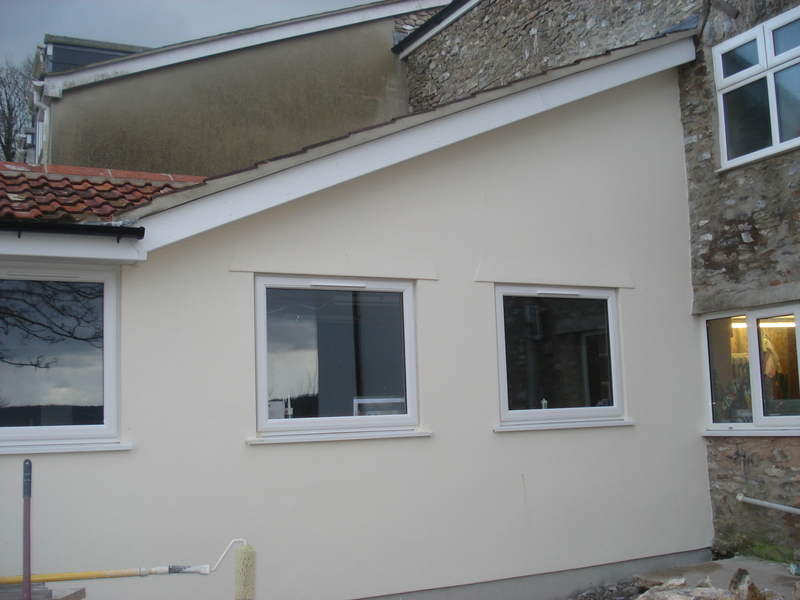 The kitchen extension windows are also in and the rendering has been painted. 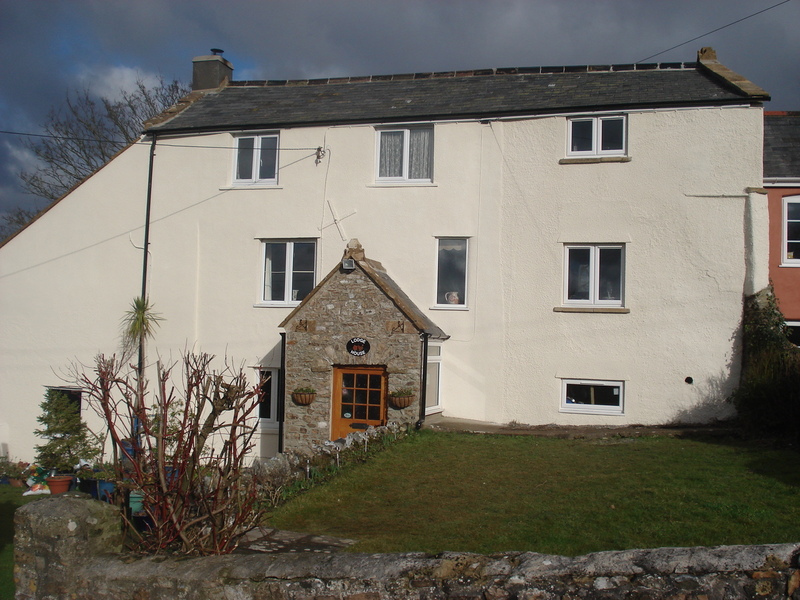 The front of the house has also been painted whilst they had the scaffold up. 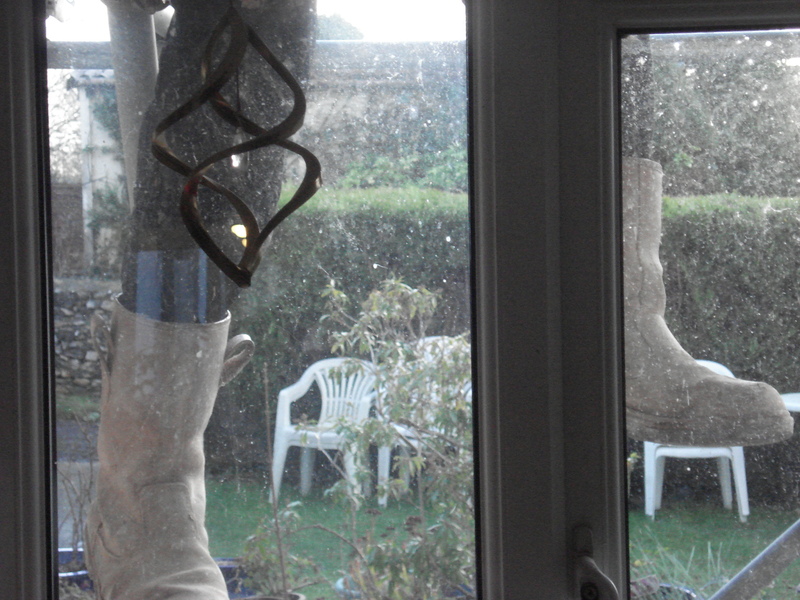 We couldn’t resist this picture of one of the builders legs taken from inside the house, as he was painting. Neil and I are feeling a bit frazzled from all the decisions we are having to make at the moment, from specifying the kitchen and the 2 ensuite bathrooms, and cloakroom, to deciding upon the tiles and where all the electrical sockets are needed, and little things keep changing all the time. We have also already gone over budget, but doesn’t that always happen with building? Oh well it will all be worth it in the end. 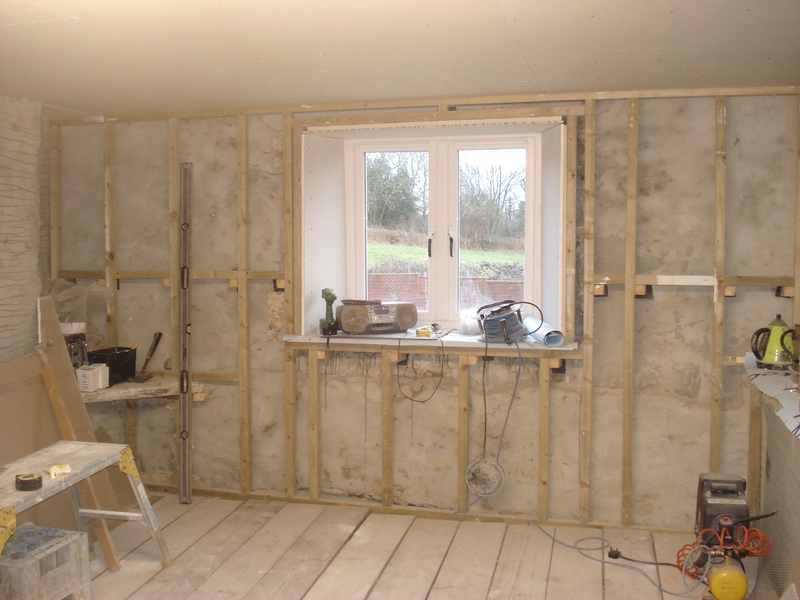 Here are some supports that have gone in prior to the plasterboard being added. 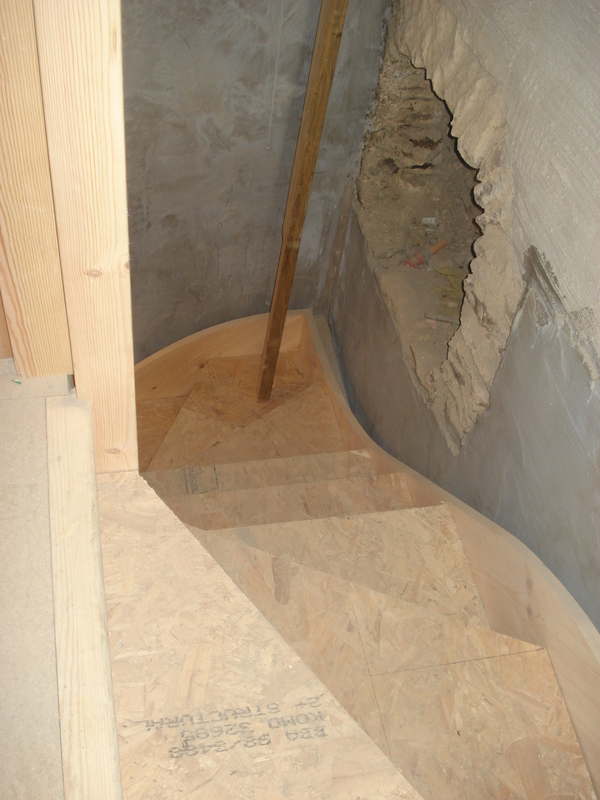 And this is under the stairs prior to plastering. We are closed for B&B at the moment as there is so much disruption to the house, so looking forward to all the work being finished and us reopening. Exciting times when the new stairs arrived for the pump house renovation. They arrived as a kit of parts, like a giant jig saw puzzle. Jolly clever the guy who put them all together as most were winders. Here are the stairs from the ground floor to the first floor. And then looking down from the first floor. 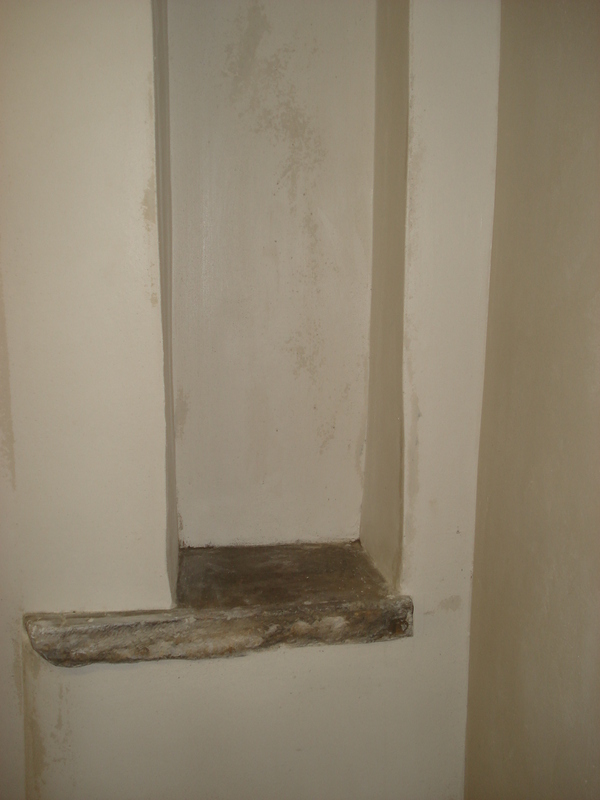 You can see the alcove where the old bread oven was. We are keeping that as a feature. These are the stairs from the first floor up to the second floor. You can just make out where the window will be. 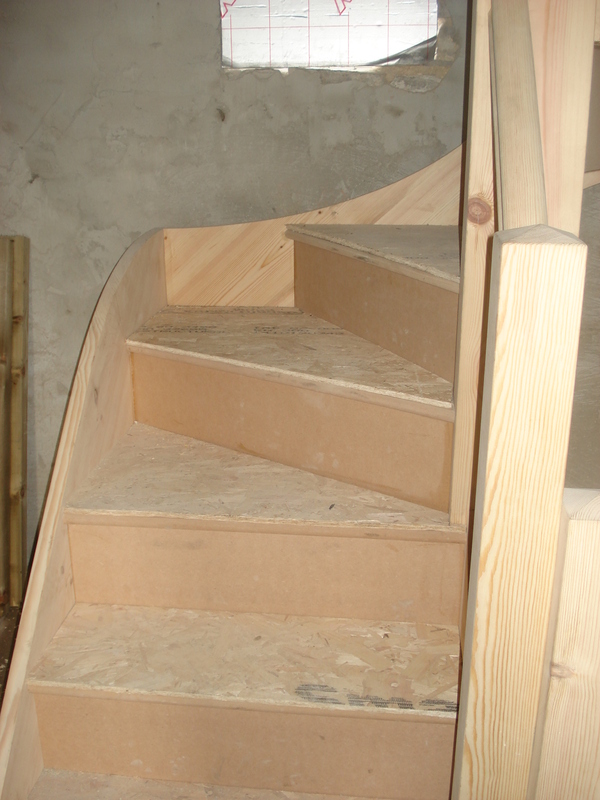 The builders have covered the stair treads with chip board to protect them so that is not the proper finish. When all the work is completed we will carpet these stairs. It’s great seeing the progress and seeing the rooms start to take shape and then we can start planning out what furniture will go where and the position of the electrical sockets. 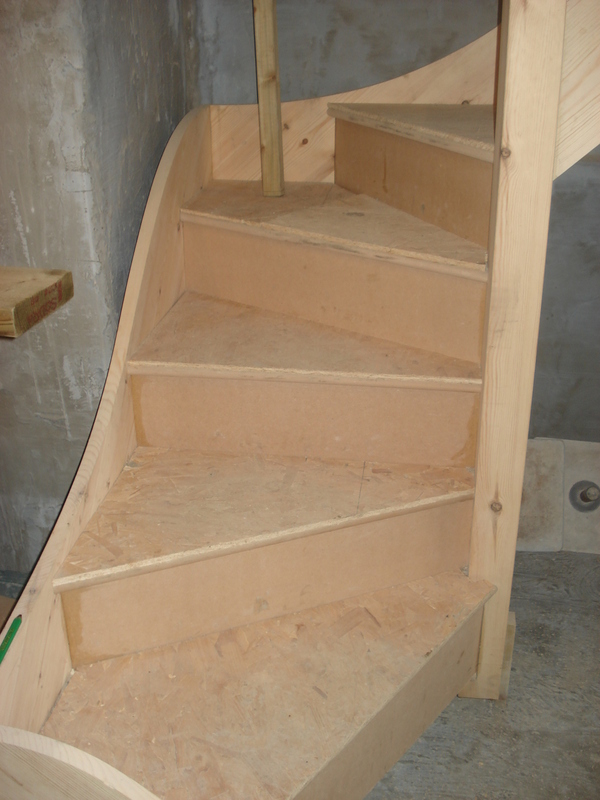 These will be the stairs to the new guest rooms, bedrooms 2 and 3 for the bed and breakfast. Hopefully opening Summer 2015. The builders have finished for Christmas. We warmed up some mince pies for their tea break and gave them a case of beer and some shortbread to share. 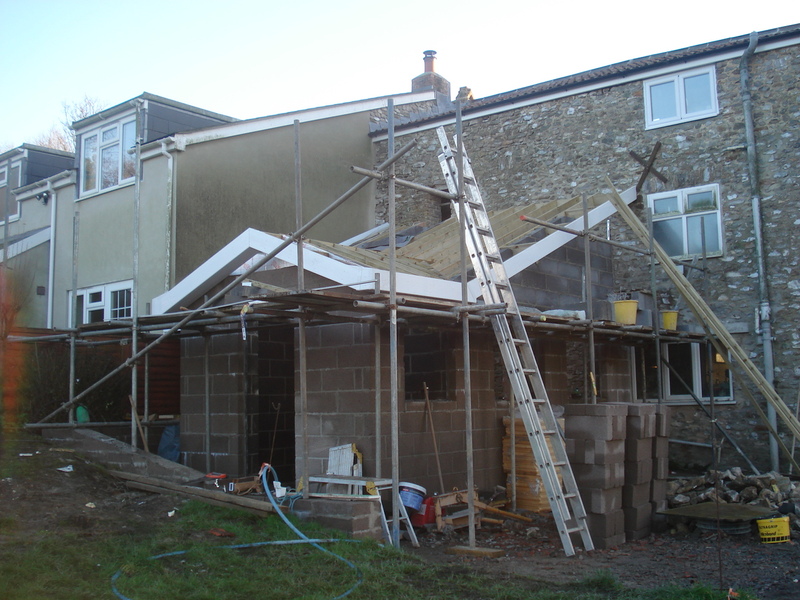 They have made great progress on the kitchen extension in the last couple of weeks. 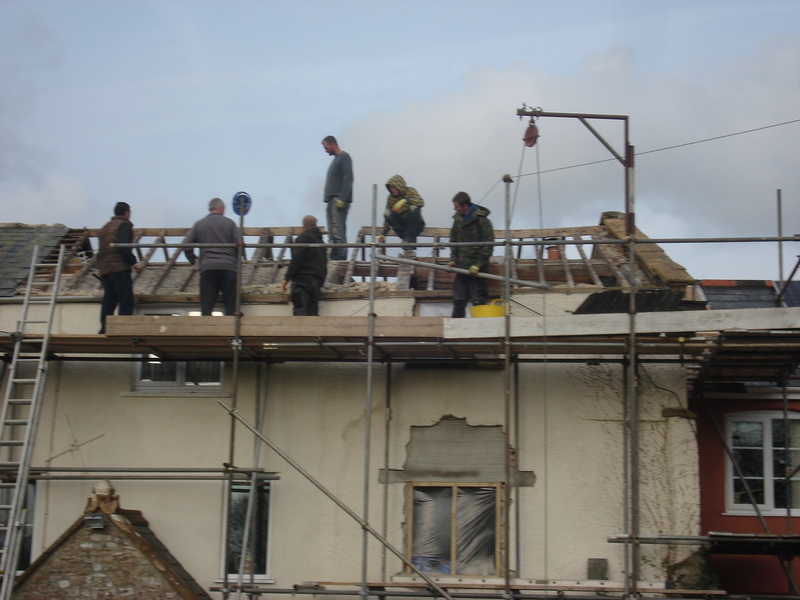 First they got all the roof timbers up. 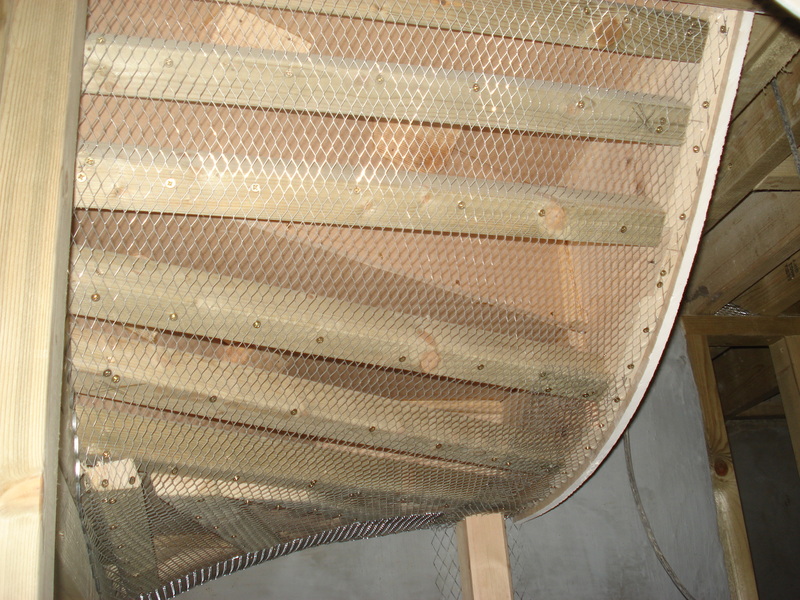 Then they added the roof tiles and carefully installed the lead channels that lead the water off the roof. It is a very neat job. The windows and door aperture have been filled in with the roofing felt material to help the kitchen floor dry out. We hope to have the windows and door in early into the New Year. It just leaves me to wish all my readers a very Merry Christmas and a Happy New Year from Kathy and Neil, Lodge House B&B. Today was the day the roof came off. 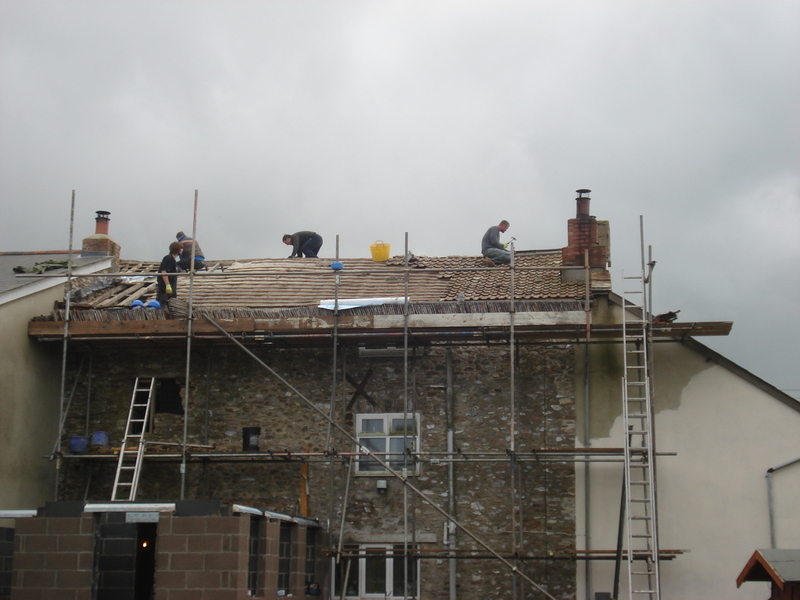 We were hoping for dry weather and today at least has been dry so the men started by taking the ridge tiles off the top of the roof. 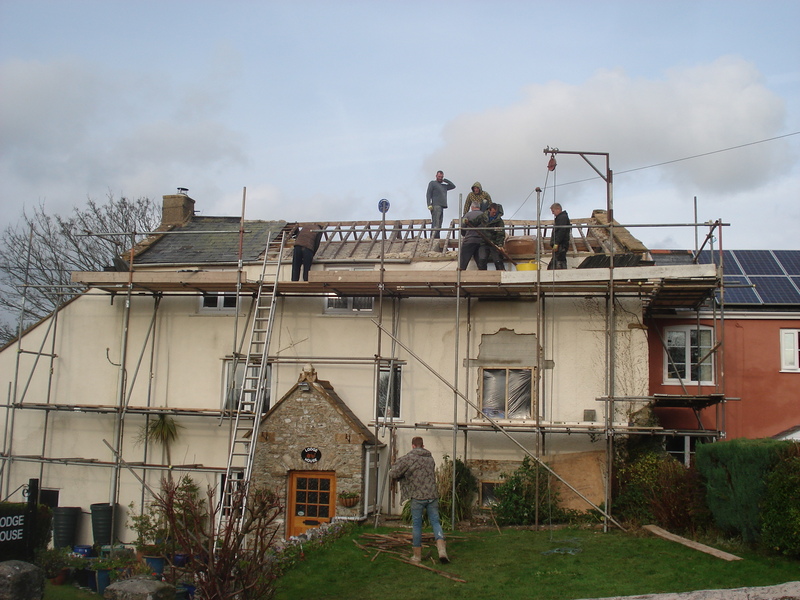 The roof over the derelict part of the house had dipped so will need new ridge timbers. 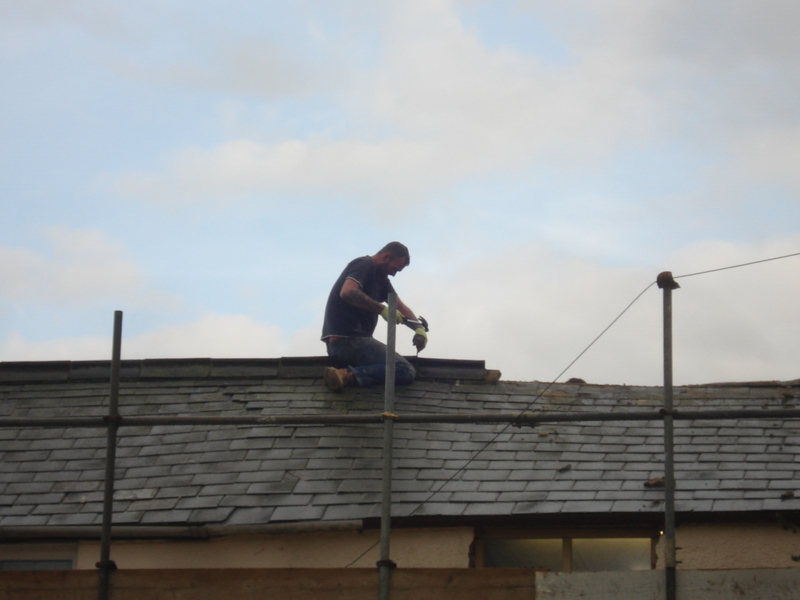 The front of the roof was covered with slates so these had to be taken down carefully one by one to preserve them. Our new roof will have insulation under the slates and tiles, none of which we have at the moment, so hopefully this will make the house warmer, especially on the 2nd floor. 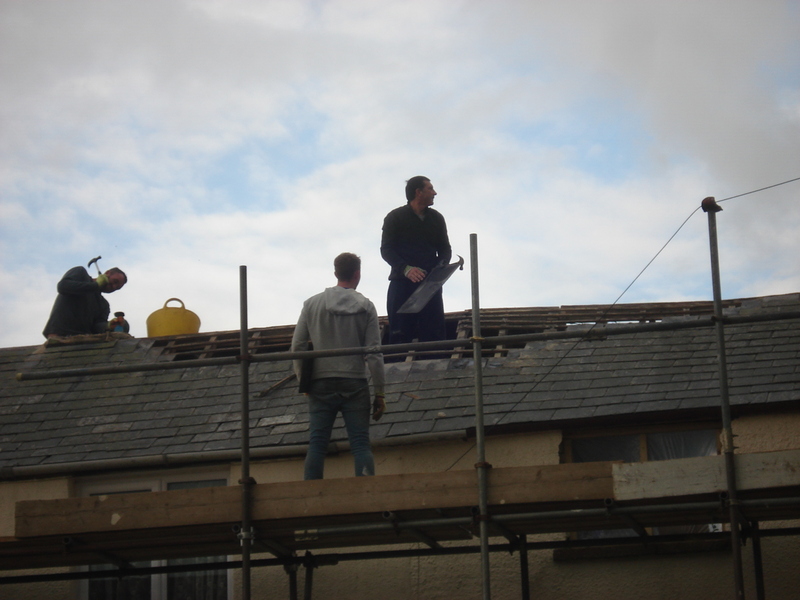 By mid afternoon the roof timbers were exposed, so the next job was to cover the timbers with a large tarpaulin. The tiles were all off the back too. The forecast for the rest of the week is rain so how they are going to manage if the weather turns, I’m not sure, we’ll have to see what happens. There were 6 guys on site today working away on the roof. It’s all good fun here, lots of noise and disruption, but just how wonderful it will all be in the end! !